My whole family has a thing for lemon cake. 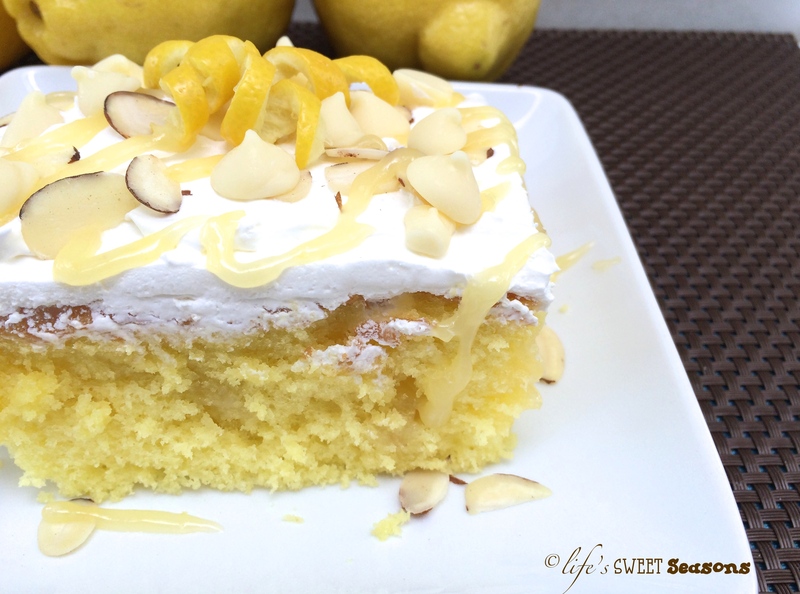 My grandpa used to make an amazing lemon cake that I haven’t posted yet…That’s crazy. Why haven’t I? No idea. But my point is that I’m pretty sure we all have him to blame. I’ve been craving lemon-flavored food this week, which is why this recipe is following the Unstuffed Chicken which is covered in a lemon-butter sauce. Unfortunately I cannot take any credit for this recipe. 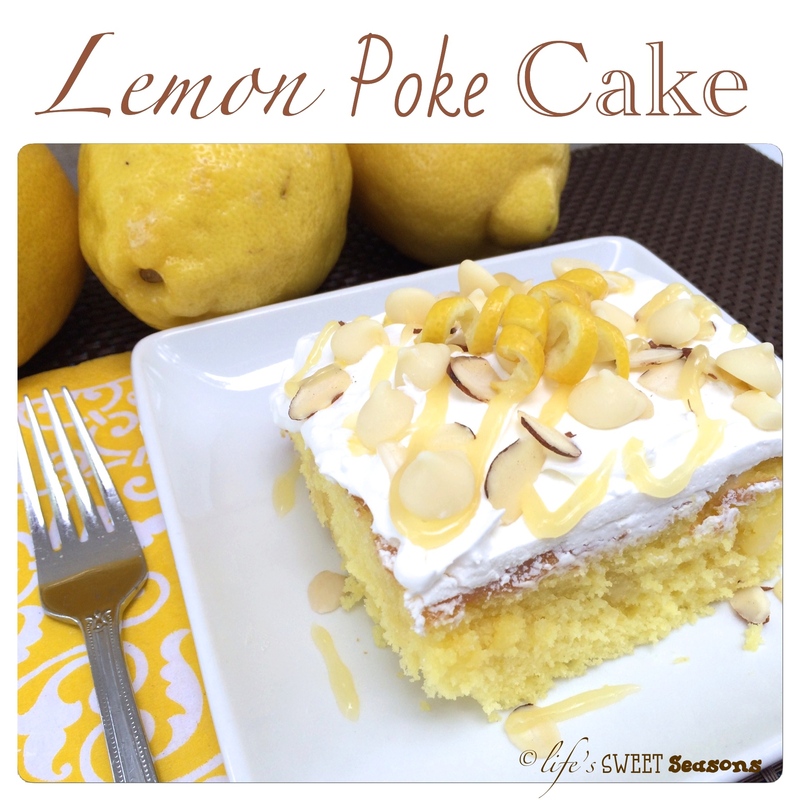 This is by Ashton from Something Swanky and after having tried this recipe and her Grasshopper Poke Cake last summer I’m convinced that she is a poke cake genius. The only thing I’ve added to the recipe is to put lemon zest in the Cool Whip. It seemed like such a shame to waste the zest, and when it’s added into the Cool Whip it gives it a touch of zing. 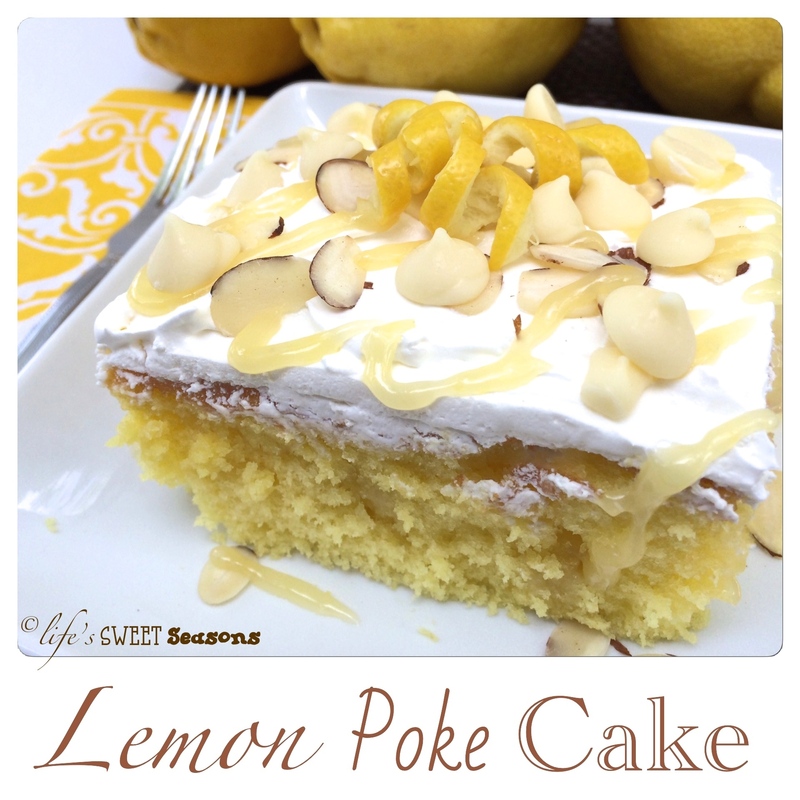 Besides, why shouldn’t there be more lemon in a lemon poke cake? Mike doesn’t like white chocolate chips so he was totally skeptical about putting them on top. I’m usually not a huge fan either, but the contrast in textures with the soft cake, soft cool whip and then crunchy nuts and chocolate is kinda nice. I wouldn’t say they are a huge necessity. I was thinking of just topping this cake with extra curd and lemon zest and calling it good, but because I’m kinda a stickler about trying recipes the way they’re written before I change them that’s what I did. I even tried this with graham cracker crumbs on top (coarsely crushed by hand) and I really liked that too. Basically, pick your pleasure. I’m not sure a whole lot can go wrong with this cake. Michael easily cleaned his plate and said, “Oh yeah. This would be a big hit at your mom’s house.” I know he’s right. I can’t wait for them to try this! Make the lemon cake as per the directions on the box. Use the bottom of a wooden spoon to evenly poke holes throughout the baked cake (approximately 25-30 holes). Pour the lemon curd over the cake, aiming to fill the holes. Use a rubber spatula to spread the curd evenly over the cake. Let chill for at least 4 hours. Overnight is best. Whisk all ingredients together in a large bowl (contents WILL bubble up when stirred, so make sure you have plenty of extra room to avoid a spill-over). Microwave ingredients for up to 10 minutes. REMOVE AND STIR after every minute. Once mixture begins to thicken, you can discontinue heating. It generally takes mine 6-8 minutes to look just right. Line a smaller bowl with a zip top bag (use a high quality brand so it doesn’t melt). Pour the lemon curd into the zip top bag and seal it up. Fill the bowl with ice water and place the bag of lemon curd in the ice bath. Place the bowl in the freezer for about 10 minutes. Curd will be thickened and chilled once removed and ready to serve.